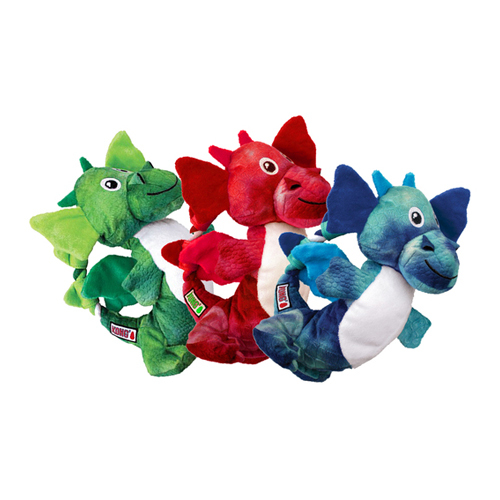 The KONG Dragon Knots are soft yet strong toys for your dog. What's more, the crinkly noise in the wings ensures that your dog stays focused on the toy. Because the toys have strong rope on the inside, the Kong Dragon Knots will entertain your dog for hours on end. The KONG Dragon Knots are soft yet strong toys for your dog. The toys have strong rope on the inside, allowing the Kong Dragon Knots to entertain your dog for hours on end. Thanks to the squeaker and the crinkly noise in the wings ensures that your dog stays focused on the toy for longer. Available in green, red and blue. This product is delivered at random, you cannot select your colour. Have you used KONG Dragon Knots before? Let us know what you think about this product.